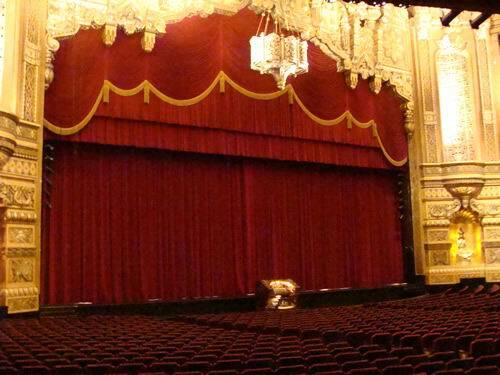 The seating count of the theatre was 5,048 when the theatre first opened. I saw a copy of a recent Olympia Entertainments usher handout brochure that mentions seating configurations and counts. Including the removable seats in the orchestra pit section (not always present). 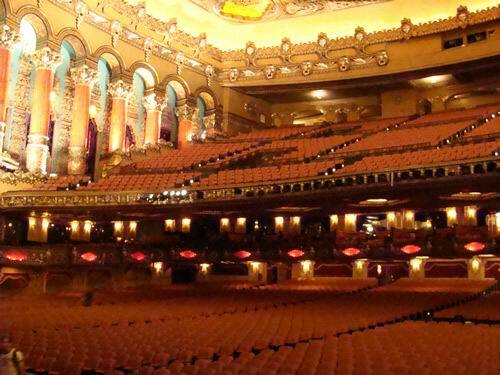 the maximum seating of the Fox is 5,174. On Janurary 10, 1953, I had my first date with what would become my husband of 56 years. We sat in the upper balcony. In June I graduated High School and began working downtown Detroit at AAA. We were married in May 1954, but we both remember the date Janurary 10, 1953 at the Fox Theater. I lived on the lower East Side on Coplin near Vernor Hwy. Across the street was a family by the name of Herbert. Mr. Frank Herbert had a very large family and St. Vincent DePaul Society obtained the job of Custodian for him I think in the 30s. His oldest son Vincent became head usher and another brother, Leonard, also worked as an usher when he got old enough. 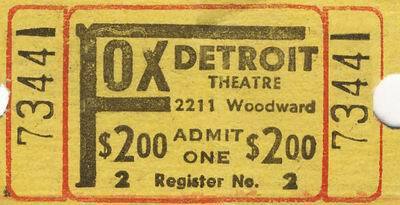 When we could afford the high price of 25 cents for the show and 20 cents for the streetcars, we went to the Fox as often as possible. Our neighborhood show was the Cinderella. My mother would give my sister and me 25 cents to split between us - 10 cents each to get into the show and 5 cents to be spent on candy in the store adjoining the show. For the extra penny we would buy 2 squirrels (candy). When the war came we had to pay 11 cents to get into the show because a tax of 1 cent had been added to the price. Then we only had 3 cents for candy. Those were the good old days. Now look what goes on at the Fox! Im glad it survived. 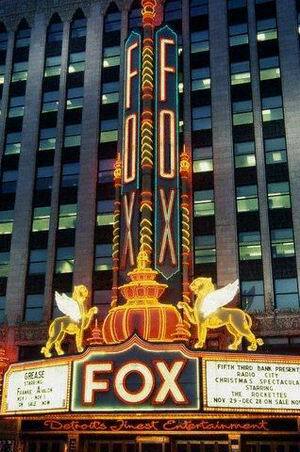 Some facts on the Fox: * It took 18 months to build this theater, costing an estimated $12 million. The original staff numbered over four hundred, including ushers, set designers, matrons and doormen. 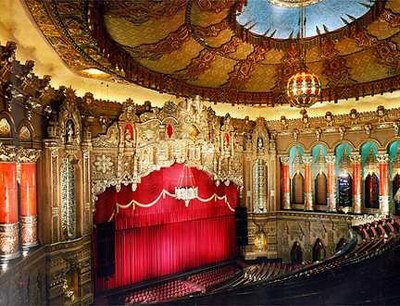 * The Fox Theater was the first in the world to be constructed with built-in equipment for talking movies. Under the Fox Movietone patents, a highly sensitive photo-electric cell converted sound waves into light waves back into sound that was amplified and passed by cable to the stage. * A childrens dancing school was started in 1931. More than 14,000 youngsters attended classes. * It was in 1937 that Detroit News reporter Rex Grover featured the Foxs Gae Foster Girls -- a chorus group that performed between movies -- in a pictorial special that ran in the weekend Roto magazine. His account of their backstage life implied that they sat around reading confession magazines, passing their time with idle gossip. The chorus girls were so incensed that they wrote a letter to the editor of The Detroit News challenging the reporter to find six girls from Detroit -- no Phi Beta Kappas -- to compete against six from their group in an intelligence contest. 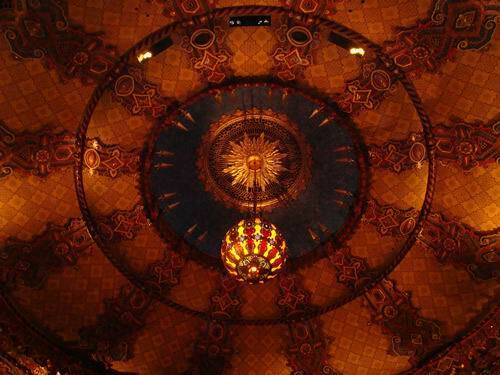 * In keeping with the spirit of Memorial Day, The Fox Theater began observing Americanism Week in 1939. 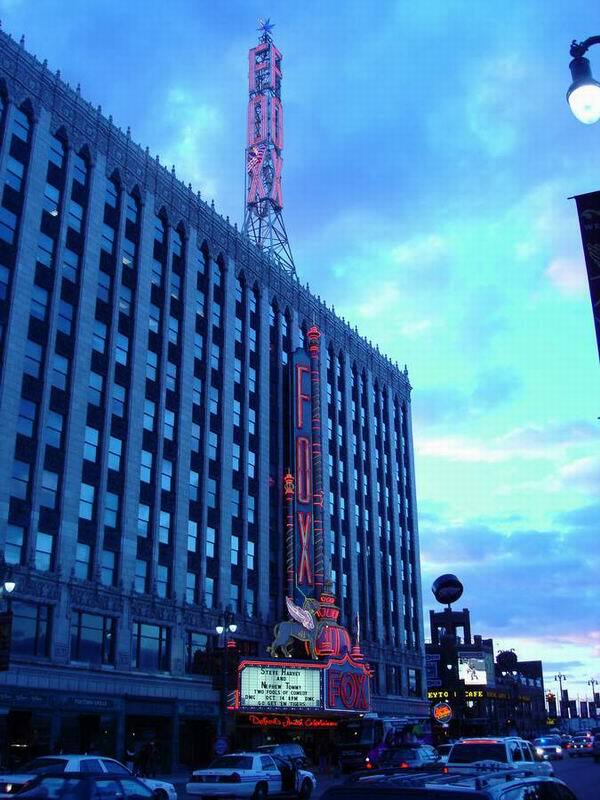 All Detroiters having obtained their final American citizenship papers since May 1 of that year, were guests of the theater during the showing of Only Angels Have Wings. The presentation of their citizenship papers plus the required Federal admission tax allowed them entrance. 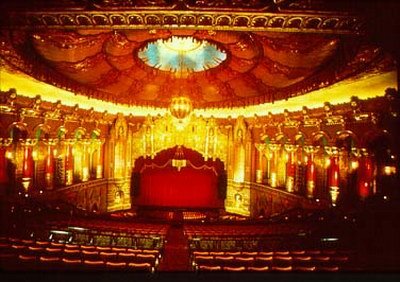 * Weekend attendance records at the Fox Theater were toppled by Kay Kyser and his College of Musical Knowledge in March 1939. More than 61,000 persons jammed the house over three days, surpassing previous attendance records set by Benny Goodman, Tony Martin and other favorites of the time. * For the showing of the screen musical, The Boys From Syracuse, which depicted the hilarious mistaken identity problems of twins, the Fox sponsored a twins contest. All twins attending the weekday performances were given free admission along with a souvenir photograph of themselves. Cash prizes were awarded to the most perfect set of twins. * On Feb. 19, 1943, the first war-worker dawn show had more than 9,000 war plant workers from the night shift attending its 2 a. m. show. Workers were encouraged to come as you are and enjoy some much needed entertainment. 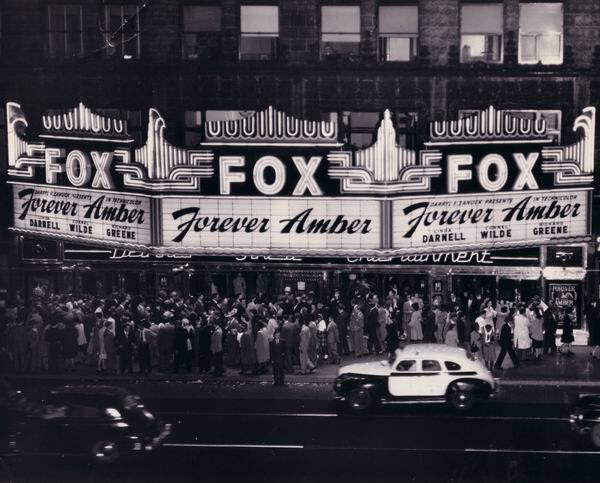 Various owners kept the Fox open and profitable through the 1940s with such acts as Benny Goodman, Sarah Vaughn, Louis Armstrong, Kate Smith and Jack Benny packing the seats. The Fox grossed $75,000 a week during World War II, offering a steady stream of newsreels and movies to audiences hungry for war information and diversion. Berry Gordys Motown Revue began a Christmas tradition in the early 60s. 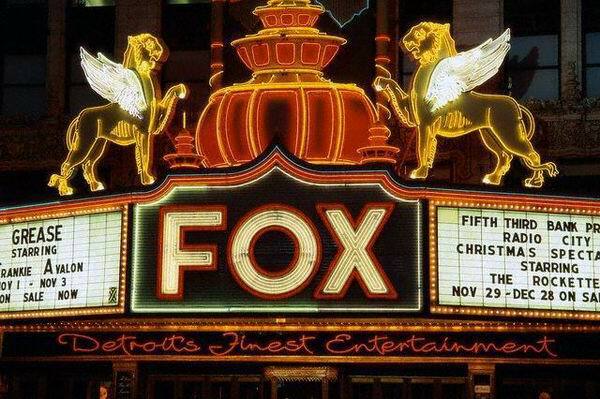 The Fox was packed for ten days from Christmas to New Years with four or five shows daily featuring home-grown talent like the Temptations, the Supremes and Smokey Robinson. 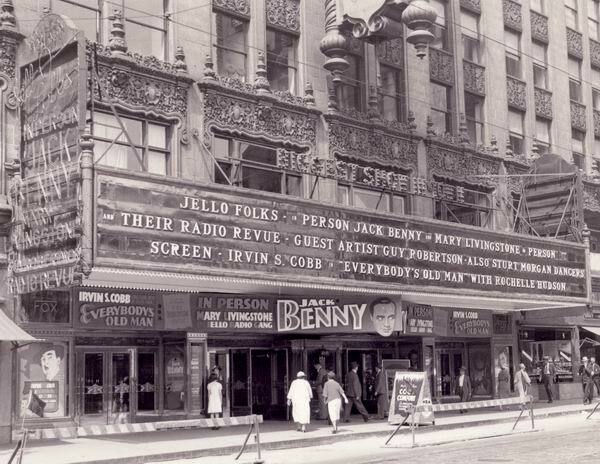 By Laurie J. Marzejka / The Detroit News When the opening-night curtain rose at Detroits Fox Theatre on Sept. 21, 1928, an audience of 5,000 invited guests came to 2211 Woodward Avenue to see what had been billed as a Temple of Amusement. The did not go home disappointed. 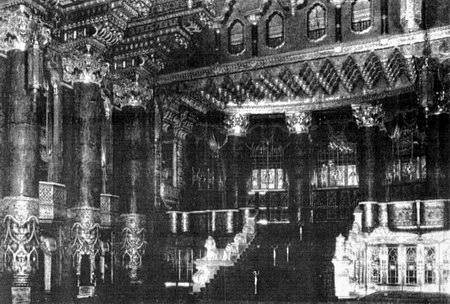 The Theater, an awe-inspiring combination of Far Eastern, Indian and Egyptian styles, was the second largest Theater in the world. But it surpassed all others in grandeur. 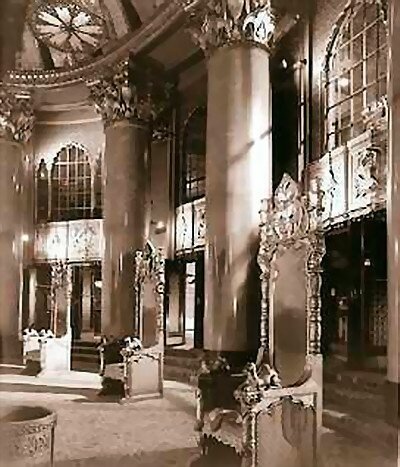 The lobby of this mammoth 10-story structure, which was six stories high and half a block long, was surrounded by blood-red marble columns. Each column held its own jeweled figure representing various Asiatic Gods. The decorative scheme used subdued tones of gold to contrast a riot of color. Hangings in the lobby were in golden damask and stage draperies combined regal-red velour and damask which were set off by a festooned drapery with a wide silken fringe. Guests were greeted by notes from a small Moller organ situated over the entrance. 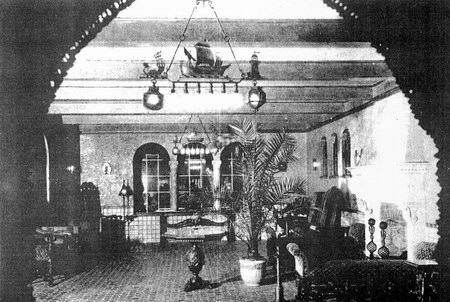 The 3,600-square-foot lobby was covered by the largest wool rug ever made by an American manufacturer. Weighing approximately 3,000 pounds, this carpet reached to the foot of the lobbys grand stairway that led to the mezzanine and balcony levels. 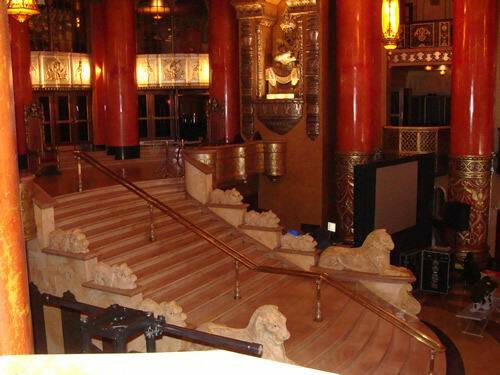 There was also an escalator and large passenger elevators --- the only theater in Michigan so equipped. The auditorium was 175 feet wide and 110 feet high. Large colonnades flanked the auditorium and behind these was a promenade where the patrons could stroll and view the entire theater. 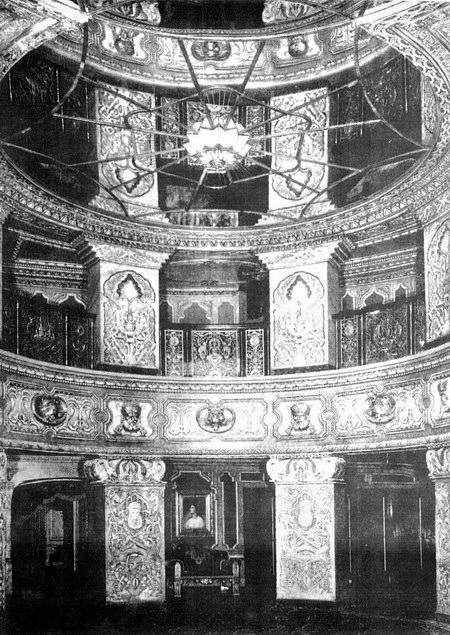 A tier of seats in the rear of the balcony were designated as smoking loges and equipped with special fans to carry away the smoke. The main ceiling of the auditorium was designed as a huge canopy, with sky lights above it, and decorated in the style of the durbars of India. 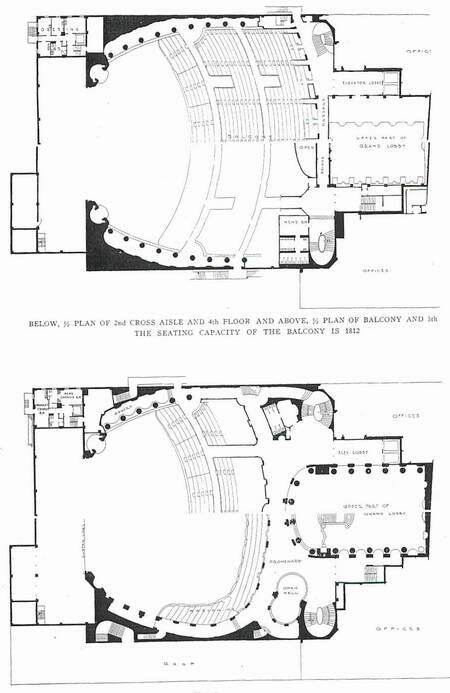 One innovation in movie theater construction was the inclusion of three-foot aisles in front of every row of seats. This allowed for the passage of patrons without making it necessary for those seated to stand. 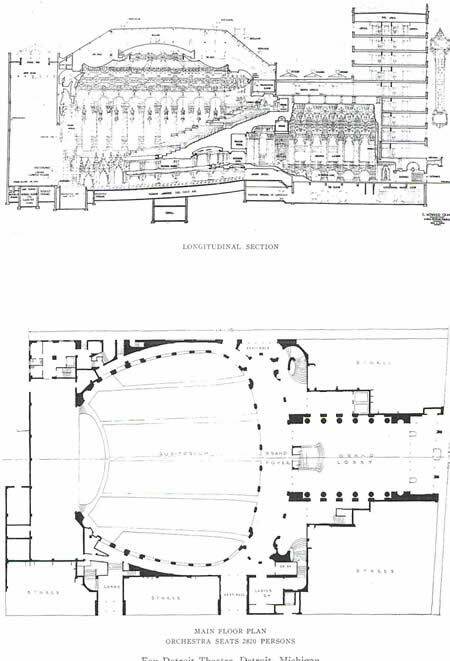 The orchestra pit was built on a platform that could be raised and lowered by pneumatic pumps. Similar platforms built into the stage allowed for unusual effects. The theater was equipped with loudspeakers that would provide a uniform tonal quality throughout the entire theater. The inaugural performance at the Fox opened with the playing of The Star Spangled Banner by the 60-musician-strong Fox Theater Grand Orchestra as they rose dramatically into view on the elevator platform. On stage the inaugural production, The Evolution of Transportation, depicted the progress of Detroit from Indian days to the present utilizing a troupe of 32 dancing girls called Tillerettes and a choir of 50 voices. This performance was followed by the showing of a Fox Movietone news reel---with sound. The feature film was Street Angel, starring Charles Farrell and Janet Gaynor. 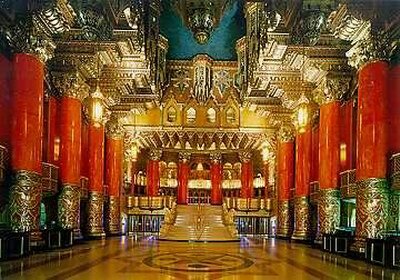 The Fox Theater was designed by architect Charles Howard Crane, a Detroiter who had once worked for Albert Kahn. 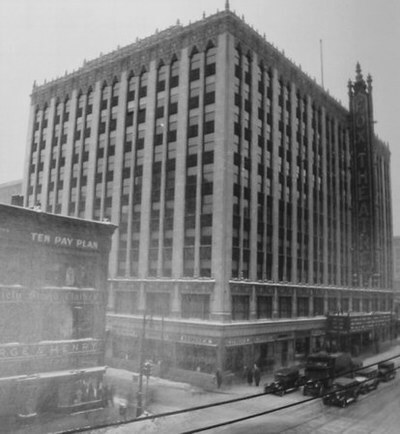 Crane was also responsible for Orchestra Hall (1919), the Capitol on Broadway (1922) and the State on Woodward (1925). 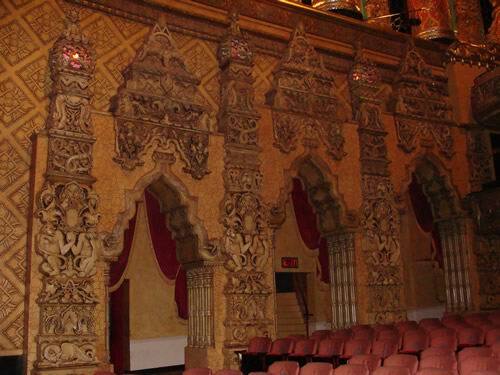 Crane designed the United Artists Theater on Adams as well as 250 movie houses across Canada and the United States. 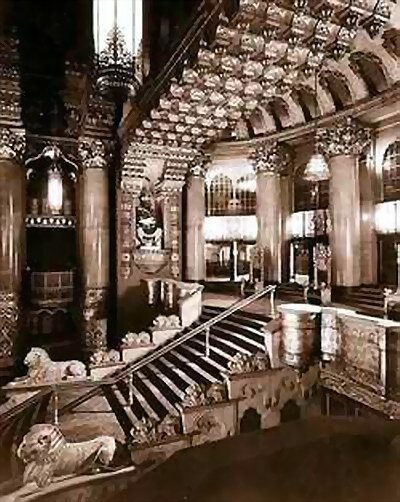 Credit for the magnificent interior of the Fox Theater belongs to Eve Leo, wife of pioneer film producer William Fox. Fox was founder of the company which still bears his name today -- Twentieth Century-Fox Fox, son of Hungarian immigrant parents, had a rags-to-riches-to-rags career. Turned down around the turn of the century for a $3 raise from his $17-a-week job as a pants presser on New Yorks East Side, Fox took his savings and bought a down-at-the-heels Brooklyn nickelodeon. 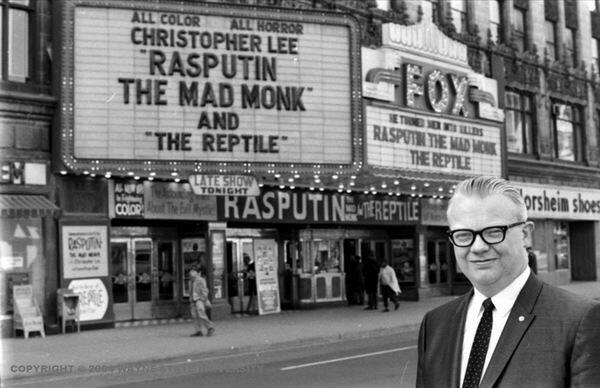 At the height of the post-war boom 25 years later he was the ruler of a cinema kingdom which included Detroits Fox Theater. One of the biggest deals ever transacted in show business was his acquisition of the 255 theaters of the West Coast Theaters Circuit, appraised at $100 million. 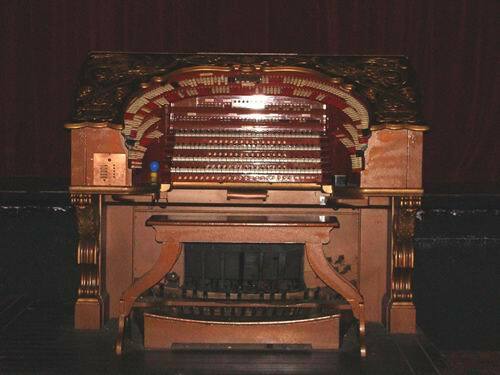 He later added to his string the famous Roxy Theater in New York. He controlled corporations estimated to be worth $165 million and at the pinnacle of his career he was said to have carried $6. 4 million in life insurance -- more than any other man in the world at the time. A few months after the stock market crash of 1929, he lost controlling interest in the Fox Films Corp. and the Fox Theaters Corp. and resigned his leadership positions at both firms. He continued on as chairman of the companies advisory board but a welter of stockholders lawsuits and government tax judgments drove him to voluntary bankruptcy in Atlantic City, N. J. , in 1936. 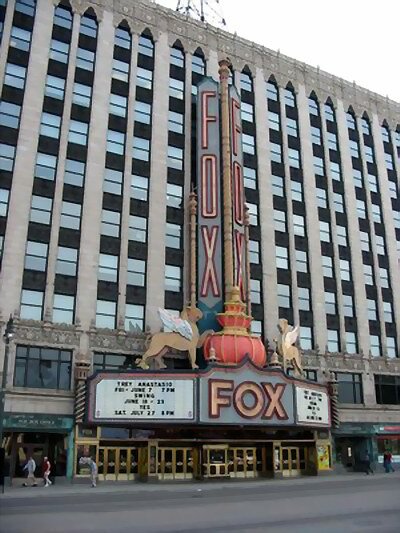 Detroits Fox theater changed hands several times before Mike and Marion Ilitch of Little Caesars Pizza closed a deal in 1987 for the purchase of the theater and connecting office building. 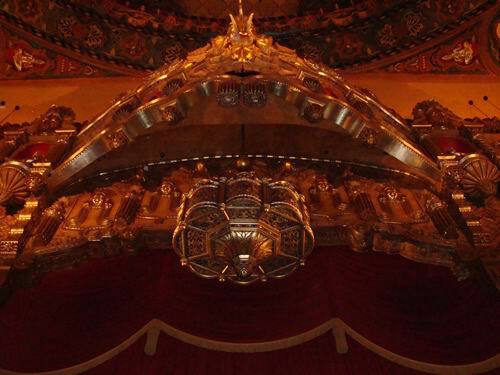 A multi-million dollar restoration project, which included a new 10-story marquee, culminated in a grand reopening Nov. 19, 1988, when the curtain once again rose at the theater known as the Temple of Amusement. 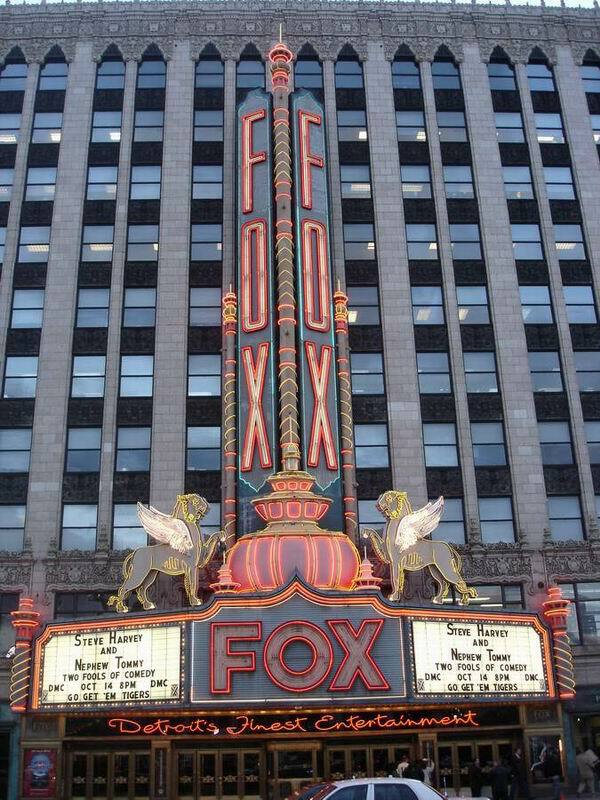 The Fox Theatre seats over 5,000 people and is Detroits largest movie palace. In 1988, the Fox underwent an $8. 1-million restoration. 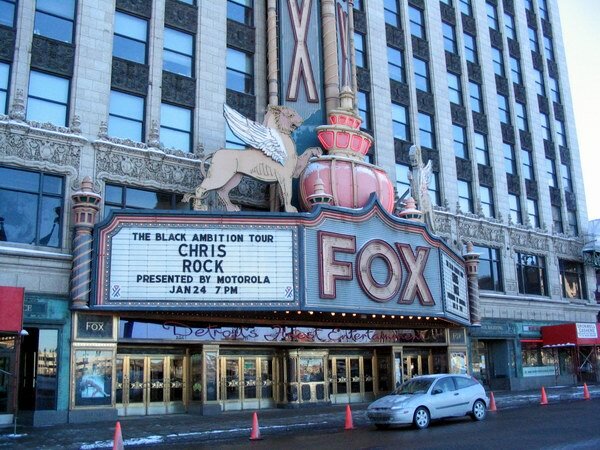 Since the restoration, the Fox has become one of the most successful theaters in the country combining broadway shows, concerts, special events and the occassional classic film.